No cast iron skillet? No problem! Making tender, flavorful fajita veggies doesn’t have to be complicated. Just grab whichever skillet or sauté pan that you have, some veggies, and whichever seasonings you like! 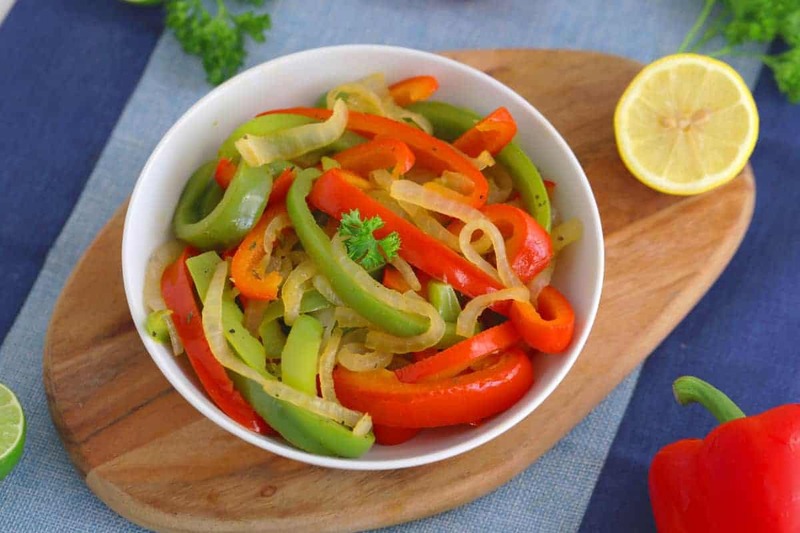 The key here is to give your peppers and onions TIME to soften up and release their natural sugars, creating that classic caramelized goodness. A fun and easy way to pack more flavor and more nutrients into a meal! Of course, this recipe is just one possibility. Think of this recipe as a guide for how to make fajita veggies, and cook up whichever veggies you enjoy most. And, if you’re a fan of spicier food, feel free to add a bit of chili powder and/or cayenne! Then, serve up your fajita veggies however you like—there are endless options. Go with classic tortillas for burritos or tacos, make your own burrito bowl, or try a DIY taco salad! *Check out my vegan and vegan & vegetarian taco salad recipe, served in homemade baked tortilla bowls! Heat oil in a pan over medium heat. Add peppers and onions and cook for 8-10 minutes. Add seasonings. Cook until tender, about 2-3 more minutes.